Formed by the union of High Peak Group of Companies and NewWest Enterprise Property Group, McCOR Management was created in 2014 to provide clients with a more comprehensive real estate service at both the local and national level. 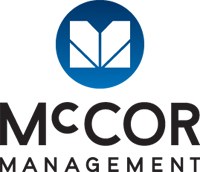 McCOR Management has offices in Calgary, Edmonton, Gatineau, Laval, Regina, Toronto, Vancouver and Winnipeg, offering the national reach needed to best serve leading investors and occupiers whilst retaining the local expertise to accommodate smaller firms and sole proprietorships competitively. The formation of McCOR Management creates one of Canada’s largest privately-owned real estate development and property management companies, with over $3-billion of assets under management. Built on the shared values, understanding and passion of its two founders, Luc Corneli and Doug McDonald, McCOR Management will build long-term value for its clients and their properties by maximizing efficiencies, minimizing costs and increasing revenues. The High Peak Group of Companies and NewWest Enterprise Property Group directors and management team pursued this path because they believe together, McCOR Management has the potential to create something unique – a boutique firm with national presence.